GreenSeed Landscapes was established in 2009. Our philosophy is to provide the best quality gardens at affordable prices while offering a personalised service. We offer a comprehensive package incorporating design, building and maintenance, and in so doing have been able to provide a service which is both competitive and of high quality. We have found that by controlling the entire process of creating a garden, from initial design to the built finish and final planting, we have been able to create beautiful gardens at affordable prices that fulfil our clients’ requirements. The same high level of attention is applied to all our projects whether it is a small makeover or large-scale garden project. We listen to our clients’ needs and we provide solutions based on those needs. 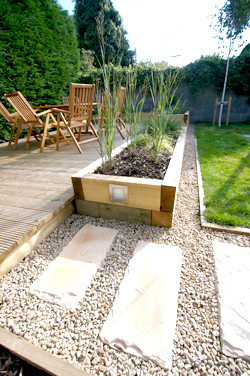 We endeavour to make the whole process of creating a garden an enjoyable one for everybody involved. We are passionate about gardens, about design and about creating an experience that is unique to each garden. If you are interested in using GreenSeed Landscapes to create or enhance your garden we offer a Free Consultation Service. We are fully registered and insured. John has been working in landscaping since 2003. He has worked as a designer for two of Ireland’s best known Landscape Architects, Mitchell + Associates and Bernard Seymour Landscape Architects. He has also worked as a gardener and in landscape construction for the National Botanic Gardens Glasnevin and Dun Laoghaire-Rathdown County Council. Adrian comes to the business with a BA in Graphic Design. He has worked in building and landscape construction, including the restoration of period houses and the construction and retro fitting of environmentally sound residential housing. His design aesthetic and knowledge of construction has allowed him to produce quality installation and finishes within our gardens.